The ’10s have been brutal for Doctor Who actors. Last month, there was sad news about Caroline John. And now comes word that Mary Tamm, who played the first incarnation of the Doctor’s Time Lady companion Romana, has died from cancer aged 62. As with Caroline John, Mary Tamm was only with the show for a year. And I can’t help but think that, like John’s Liz Shaw, the problem was that Tamm’s competent, strong-willed character was perhaps threatening to a lead actor who needed to be the most important thing on the screen. But, boy howdy, did she draw my attention away from Tom Baker. Whereas Elisabeth Sladen’s Sarah Jane Smith was the woman I wanted to marry, Mary Tamm’s imperious ice queen–and her form-fitting white dress–shook my teenage hormones like no actress in a British kids’ show previously had. I was deeply disappointed when, at the start of the following season, Romana “regenerated” into the form of Lalla Ward. 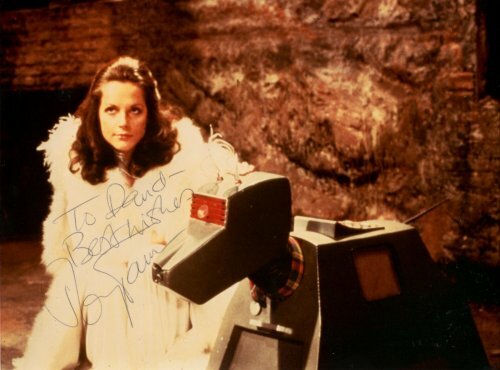 I met Mary Tamm a couple of times at Doctor Who conventions. 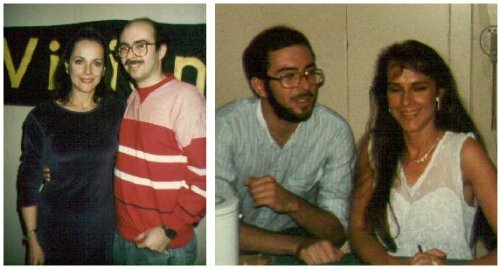 I’m really not certain how I held myself together long enough to have these photos taken. And now, please, can we have a few more years before the next member of the TARDIS crew passes?